Lotus Evora S - IPS 2012 has all the power and handling of the Evora S with the versatility of IPS (Intelligent Precision Shift). The Evora S with IPS option features the 3.5l V6 supercharged engine delivering 350 PS and optimised IPS calibration. The paddle shift manual mode allows the driver the full and uncompromised Evora S experience with the added bonus of switching to automatic mode. This is the most versatile Evora yet. You wanted more power so we delivered the supercharged Evora S.
The market needed more options so we created IPS (Intelligent Precision Shift). You demanded improved quality, we responded with over 100 changes and developments to the Evora model year 2012. Now we bring you the Evora S with IPS option – all the power and handling of the Evora S with the versatility of IPS. The S with IPS option features the 3.5l V6 supercharged engine delivering 350 PS and optimised IPS calibration. The paddle shift manual mode allows the driver the full and uncompromised Evora S experience with the added bonus of switching to automatic mode. This is the most versatile Evora yet. Group Lotus Chief Executive Officer Dany Bahar said: “We’re really proud of the IPS option for the Evora S - people loved the Evora S and we had a great response to IPS, combining these two was a natural step and we’re delighted with the result. Back in March at the Geneva Motor Show the Evora S and Evora with IPS option were unveiled. The LotusEvora, is available in two versions - the Evora and the EvoraS – and is regarded by some as one of the most exciting and genuinely useable sportscars on the market today. Both cars have a 3.5litre V6engine and both produce phenomenal performance so the obvious question is, what’s the difference between the two? The answer in a word issupercharger. The base Evora has 280PS and tops out at a quick 261km/h (162mph) whilst returning an impressive 217g of CO2per km. The EvoraS has 350PS (345hp) and 400Nm (295lbft) of torque, courtesy of a supercharger which gives acceleration of 4.8seconds to 100km/h (4.6seconds to 60mph) and a maximum speed of 277km/h (172mph). The EvoraS comes with a sport pack as standard featuring a ‘sport’ button which allows the driver to increase throttle response. The sport button also raises the instantaneous rev limit and changes the Dynamic Performance Management (Lotus DPM) settings resulting in a total experience change. There are cross-drilled brakes for improved cooling. And here’s a heads up for those who buy into the old adage ‘you can tell the men from the boys by the size of their toys’: the external emotion of the EvoraS has been improved with a completely new active exhaust which means that at the push of a button the car sounds just as dramatic as it feels. 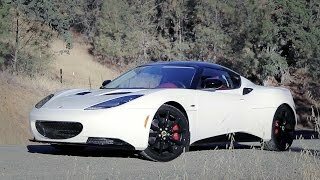 Evora IPS (Intelligent Precision Shift) option. This option gives the Evora an automatic 6-speed gearbox with Lotus developed transmission control with a 3.5lV6 engine delivering 280PS assuring a superior automatic driving experience. The IPS option of the Evora allows the driver to switch between manual paddle shift and automatic drive modes. The driver also has the option of selecting ‘sport’ mode which showcases the Lotus sport driving experience allowing the driver to really feel each gear shift and be in complete control of the transmission. Please note:At time of going to print (September 2011) the fuel economy, CO2and performance figures have not been witness tested. Group Lotus plc will publish these figures as soon as they become available on the lotuscars.com website.